March is National Endometriosis Awareness Month. Endometriosis is a condition that occurs when tissue that lines the inside of the uterus grows outside of the uterus. Different treatment options exist, ranging from pain medication to surgery. 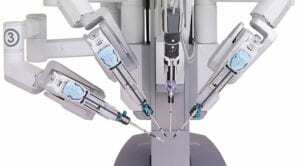 East Carolina Women’s Center offers the da Vinci Surgical System, a minimally invasive surgical procedure that uses state-of-the-art robotic surgery. Pelvic, abdominal and lower back pain (ranging from mild to severe) the few days before and during your period. Excessive bleeding: Heavy periods or bleeding between periods. Some women mistakenly believe that the above symptoms, especially pelvic pain, may be common with menstrual cycles, but they aren’t. Talk to your doctor if you experience any described symptoms. A pelvic exam and ultrasound may reveal cysts, which may be indicative of endometriosis. Surgery is not always necessary to treat endometriosis. If it is recommended, your physician can speak with you about the benefits of the da Vinci Surgical System. Only a few small incisions are required. A magnified 3D high-definition view allows your doctor to better see the surgical area and wristed instruments that bend and rotate give greater precision than the human hand. The result is being better able to complete difficult dissections (separating the tissue). If you experience difficult periods or other symptoms, schedule an appointment with your physician or discuss your symptoms during your next annual checkup. Whether you receive a first diagnosis of endometriosis or have been experiencing the condition for years, a minimally invasive surgical procedure may relieve your symptoms.